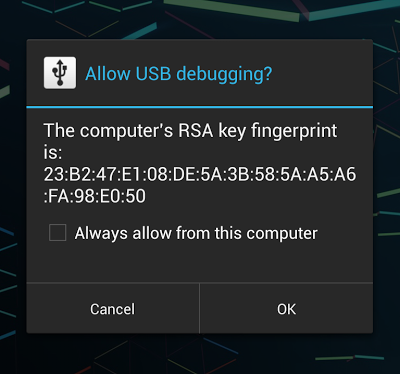 In the previous entry, we found how Android's keystore daemon manages keys and certificates, and how to connect to it using the provided keystore_cli utility. Now we will look at the intermediate layers between the OS daemon and the public KeyChain API introduced in ICS. Browsing the android.security package, we find two AIDL files: IKeyChainService.aidl and IKeyChainAliasCallback.aidl. This is a hint that the actual key store functionality, like most Android OS services, is implemented as a remote service that the public API's bind to. IKeyChainAliasCallback is just the callback called when you select a key via KeyStore#choosePrivateKeyAlias(), so it's of little interest. IKeyChainService has the actual methods KeyChain uses to get a handle to a private key or a certificate, plus some internal API's used by the Settings and certificate installer applications. Naturally, the whole interface is marked as hidden, so SDK applications cannot directly bind to the service. 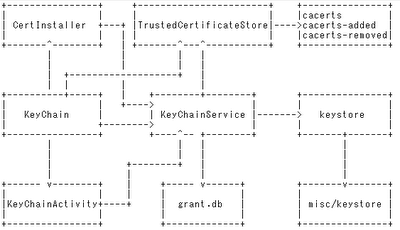 The IKeyChainService interface has one implementation, the KeyChainService in the KeyChain.apk system package. We find the source in packages/apps/KeyChain, so let's explore the app's configuration. Looking at the manifest reveals that it consists of three components: the KeyChainService, a KeyChainActivity, and a broadcast receiver, you guessed it, KeyChainBroadcastReceiver. 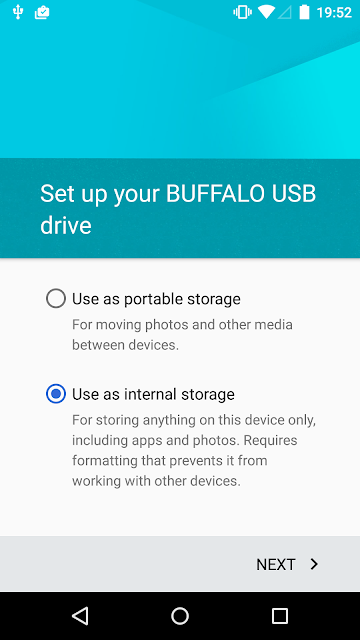 The package is com.android.keychain and its sharedUserId is set to 'android.uid.system', which, as we saw in the previous article, is necessary to be able to send management commands to the native keystore daemon. Let's first examine the service. In this example, the application with UID 10044 (our test application) is granted access to the keys with the test and key1 aliases. Each call to getPrivateKey() or getCertificate() is subject to a check against the grants database, and results in a exception if a grant for the required alias is not found. As stated before, KeyChainService has API's for adding and querying grants, and only the system user is allowed to call them. But who is responsible for actually granting and revoking access? Remember the private key selection dialog from the first article? When you call KeyChain#choosePrivateKeyAlias(), it will start the KeyChainActivity introduced above, which will check if the key store is unlocked, and if so, show they key selection dialog. Clicking the 'Allow' button will return to the KeyChainActivity, which will then call KeyChainService#setGrant() with the selected alias, adding it to the grants database. Thus, even if the activity requesting access to a private key has the needed permissions, the user has to unlock the key store and explicitly authorize access to each individual key. Besides controlling private key storage, the KeyChainService also offers trust store management by using the newly added TrustedCertificateStore class (part of libcore). This class provides both the ability to add user-installed trusted CA certificates and remove (mark as not trusted) system (pre-installed) CA's. Since the implementation is fairly complex and rather interesting, it will be the topic of another post. 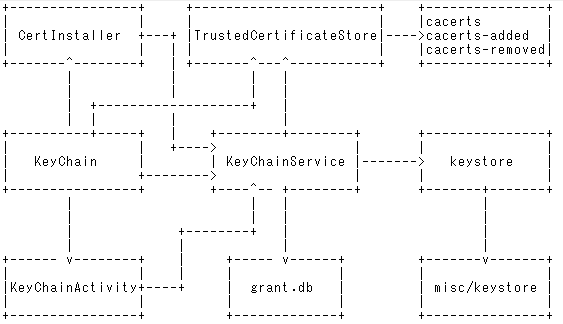 ICS introduces a new service that grants access to both the system key store (managed by the keystore daemon) and trust store (manged by the TrustedCertificateStore class) that backs the KeyChain API exposed in the public SDK. That makes it possible to control access to keys based on both the calling process's UID and the key access grant database, thus allowing for fine-grained, user-driven control over what keys each application can access. We've discussed most of the components this framework consists of in this and the previous entry. 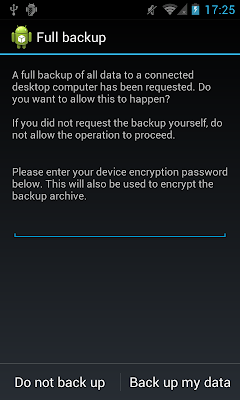 What remains is to look into the new trust store implementation introduced in Android 4.0. That will be the focus of the next post of this series. Thanks for the nice posts. Small typo near the beginning: "we find two AIDL files: IKeyChainService.aidl and IKeyChainService.aidl."